Home / Christian Living / Lent – What will you do with those 40 Days? How do you look at Lent? Do you look at it as a time to starve yourself- literally or figuratively? OR do you look at it as a time to reflect, course correct and spend time with God? I try to come up with 1-something to give up 2-something to start new and 3-something to change. My family loves that every other year I give up french fries OR diet coke. They would much prefer that I DON’T give anything up for Lent. They are sometimes the beneficiaries of the other two options. Sometimes it is writing a note in their lunch boxes or cleaning out the toy closet for them. Or spending some quality time with my husband each and every day. It is amazing how much time can go by where you and your hubby act as ground control in your home. “Off to take X here” or “You are needed for vocabulary testing in Y’s room”. Well this year, I am going to do all three in one. 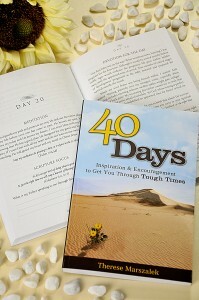 I am going to give up some of my personal reading time to DEVOUR the book 40 Days. I assume working the assignment will help me change many of the things I do today and help me create new and better habits. Would you consider joining me on this JOURNEY?